Luke: Look at you. All you need is six dancing penguins and Mary Poppins floating back in the corner to bring back two of the worst hours of my childhood. When Luke spits these words at Taylor, the two are in the midst of a verbal brawl. Well, mostly it’s Luke, throwing an epic, Taylor-inspired tantrum. The last we see of him, he’s grabbing candy from adorable period barrels and flinging them around Taylor’s adorable oldie-time ice cream shop. The catalyst for Luke’s meltdown is that Taylor has installed a picture window between his shop—which Luke vigorously opposed from its inception—and Luke’s diner. Taylor, dressed like a turn of the century dandy in a candy-striped blazer and string tie, remains preternaturally calm. In other words, he’s doing his level best to see Luke wrestled into a straight jacket and checked in as a 51/50 at the nearest hospital. Is there anything more maddening when you’re upset than someone who resolutely refuses to understand why you’re upset? It’s fairly clear Luke refers to the film adaptation. The book does feature dancing penguins and a floating Mary Poppins, but not in the same chapter/scene. The book takes most of us longer than two hours to read. And there’s Taylor, dressed to evoke Bert from the film’s merry-go-round scene, in which penguins dance and Mary Poppins floats. Mary Poppins makes two other fairly gratuitous appearances in the series. Christopher calls Lorelai “Mary Poppins” when she babysits his daughter G.G. (in “Bridesmaids Revisited”—season six, episode 16). Logan calls Rory “Mary Poppins” after she throws him an impromptu British-themed good-bye party before he leaves for London (in “Partings”—season six, episode 22). Maybe they’re meant to reference Julie Andrews’ adorable, dulcet-toned incarnation of the character. Then again, they could be P. L. Travers’ decidedly more biting creation. Either or both fit the scenes. While the two above are anybody’s guess, there is one recurring reference to Mary Poppins in the series that can only be to Travers’ novel. And it’s so subtle, you could gloss right over it. It’s Lorelai’s iconic line. She even says it in the first scene of the revival series. Lorelai loves snow.”Everything’s magical when it snows,” she tells Rory in “Love & War & Snow,” eight episodes into season one. In the middle of the night, Lorelai steals downstairs and throws open the living room window. Frigid air swirls into the room as Lorelai tucks herself into a blanket and replays a sweet message (hey, remember answering machines?!) from her love interest, Max. Enter Rory, also bundled in a blanket wondering what her mother is doing awake, with the window open, listening to an answering machine message. They banter about how some of Lorelai’s happiest memories were made on snowy days—her best birthday, her first kiss, Rory’s birth, Rory’s first steps. Smelling snow makes her feel “tingly,” Lorelai says (and no, not because of frostbite, despite what Rory says). “Love & War & Snow” is an episode of serendipitous happenings. Max’s car happens to break down in Star’s Hollow. On a Friday night. When Lorelai can’t make it to Friday night dinner. Because it’s snowing. While Rory is stuck at her grandparents’ house in Hartford. Leaving Lorelai with an empty house and a stranded beau. 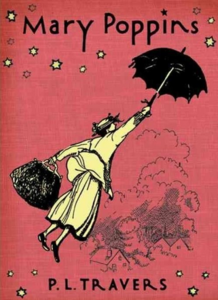 These three magical words—“I smell snow”—are also uttered by Jane Banks, the oldest of Mary Poppins’ charges, in Travers’ novel. They are the first three words of a chapter called “Christmas Shopping,” in which magical things come to pass. As they do when Mary Poppins hangs around. Mary Poppins and the children have been, yes, doing their Christmas shopping. As they prepare to head home, a radiant little girl flits through the shop’s revolving doors, capturing the attention of, well, everyone. What would you do if a half-dressed glowing sprite came bounding into a store on a frigid winter day? You’d stop and stare, is what you’d do. The girl is called Maia, and she is one of the Pleiades, come down to Earth to do her Christmas shopping. Even stars have to buy presents for their sisters, apparently. But who is going to buy a present for Maia? After having gone on for the entire chapter about her delightful fur-topped gloves that perfectly set off her outfit, Mary I-love-admiring-myself-in shop-windows Poppins unceremoniously removes them and stuffs them onto Maia’s small hands, saying “It’s cold today. You’ll be glad of them.” Don’t try to commend her for it. She’ll probably just sniff disapprovingly. That’s Mary Poppins for you: prickly and dismissive, except when she’s not. In short, Mary Poppins is Not To Be Trifled With. Just ask Jane’s brother Michael, who after getting on Mary Poppins’ last nerve finds himself seconds away from becoming an appetizer for a Polar Bear, Macaw, Panda, and Dolphin. But Mary Poppins can also be generous, caring, and deeply respectful. She is sensitive to her beau’s feelings. She's deferential to a a mysterious woman ... who claims to have been around during the Norman Conquest, has fingers that can also double as some sort of teething biscuit, and is in charge of putting stars in the sky. Also? Mary Poppins always says “please,” even when she's "in a mood" and barking out orders. Though Lorelai and Rory are both called “Mary Poppins,” the character I most associate with Travers’ creation is Emily. Like Mary Poppins, Emily is imperious, always impeccably groomed, and generally pleased with herself. She has a sharp tongue and an unyielding nature. Just ask the trail of fired maids she leaves in her wake. Or Lorelai. Just ask Lorelai. Emily can also surprise you with kindness when you least expect it—reassuring Rory that she is loved and appreciated after her paternal grandparents dismiss her, providing words of encouragement to Lorelai after she admits her marriage to Christopher is over, loving Richard enough to marry him a second time. Emily is tough, and she is sensitive, enough to be terribly hurt to learn from a stranger that her daughter got engaged. In other words, she’s a mass of contradictions and enigmas, much like Mary Poppins. Then again, aren’t we all, at least a little bit?